Join the Crew at Nub’s Nob for some of our favorite events of the season! The 19th annual Nub’s Nob Open House returns Saturday, October 6, 2018 from 9 a.m to 5 p.m. This is a great day to prepare for the ski season and enjoy the fall with your friends at Nub’s Nob. Purchase your Season Pass at the discounted rate! Enjoy a free chairlift ride and take in the fall colors. Eat lunch at the famous free Nub’s BBQ. Find a great deal on used ski & snowboard gear at the Harbor Springs Ski Team Swap from 9 a.m. to 2 p.m.
Drop off your skis and snowboards at the Tune Center for a $30 World Cup Tune! The World Cup Tune includes a stone grind, edge sharpen, wax and binding check (must bring a boot). NEW this year- “The Snowmaker’s Challenge” sponsored by The Outfitter of Harbor Springs! Think you have what it takes to be a snowmaker? Challenge yourself in this uphill foot race. The route is simple- straight up Smokey. Race begins at 2 p.m. all ages are welcome and there is no cost, simply sign-up in the lodge* on the day of the race. Awards and SWAG at 3 p.m. on the Nub’s Pub deck (weather permitting). *Must sign release form to participate. Ring in the New Year at the bottom of the Green Lift on Monday, December 31, 2018 at 6 p.m. The Nub’s Nob Ski Patrol and the Winter Sports School skiers will make two runs down Smokey with flares in hand creating a beautiful light display. This is a great family event especially for little ones who might not be able to stay up until midnight. Free of charge and no ticket required. All of our Demo Skis go on sale at wholesale prices on Sunday, February 17, 2018. These are high end skis from Blizzard, Dynastar, Head, Nordica, Rossignol and Volkl. Try a pair of these high end skis any day of the week at the Nub’s Nob Demo Center. GS Racing returns to Valley on Saturday, February 23rd, 2019. This is a great event for aspiring racers of all ages and abilities. Prizes provided by Dynastar/Lange. Register anytime before 12:30 p.m. on race day. Racing begins at 1 p.m. The 56th Annual Nub’s Nob Open is Saturday, March 2nd, 2019. This is Northern Michigan’s premier slalom racing events open to the public. Top to Bottom World Cup style Slalom courses on Birch Run and Smokey. The 5th annual HEAD Banked Slalom returns Saturday, March 9, 2019. Try your hand on a totally unique bank to bank course right down Birch Run. This event is for all ages and abilities with an emphasis on fun. Boarders and skiers are all welcome here with tons of prizes for different ages and divisions all compliments of HEAD Skis. $10 entry fee. 2019 results are available here. Sunday, March 17, 2019. 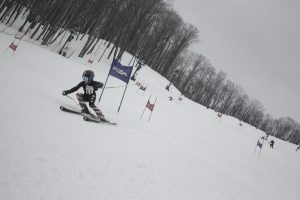 A unique head-to-head dual-paneled slalom course on JB Arena with a cattle gate start. 11:00 am: Racers compete by age and gender groups for a place in the top three per group. Competitors take one run on each course and are ranked based on their cumulative time. 1:00 pm: The top eight female and top eight male competitors overall will enter a bracketed elimination round. Winners will progress until only the King and Queen of the race remain. We will be firing up the grills slope-side at 1:00 for lunch as well. Spectators and cheering sections are encouraged. Entry fee for racers is $10, which does not include a lift ticket. Awards will be presented 30 minutes after the elimination round is complete in the Back Cafeteria. 2019 Results available here. Saturday, March 9 thru Sunday, March 17, 2019 our Canadian friends can receive full price lift tickets at par using Canadian currency. So plan on coming south of border and visiting your friends at Nub’s Nob! Join the Crew on Saturday, March 23, 2019 for our annual Spring Fling. This is a family event with costume contest, silly races, the Dorie Sarns Challenge, live music by the Jelly Roll Blues Band and the famous Soaker Cup. This is a day to enjoy the coming spring and see all of your friends at Nub’s Nob. More information available here or at the front desk.